It is unknown if the bridge incident was connected to Occupy Wall Street’s plans for nationwide protests Tuesday. It is unknown only in the sense that there is no reason to connect Occupy Wall Street with an anarchist group planning a violent act. By the same logic it might be said that it is unknown if the bridge incident is related to anything planned by Fox, the Republican Party or any Tea Party group. However, Fox’s goal is to spread false narratives, such as that Barack Obama is a Muslim socialist and that Occupy Wall Street is a terrorist organization. Neither fair nor balanced. Certainly not true, but discrediting Occupy Wall Street is consistent with the conservative movement’s top priority of redistributing wealth to the ultra-wealthy. Incidentally, while I wouldn’t try to confuse Fox with a terrorist organization, there is something both uncomplimentary and true which can be said about Rupert Murdoch today In the UK, members of Parliament are saying that Rupert Murdoch “is not a fit person to exercise the stewardship of a major international company” and showed “willful blindness” to what was going on at News Corporation. The five were “controlled by an undercover FBI employee,” and agents had them under extensive surveillance for a long period of time. On the one hand I have questions as to the degree to which the FBI is taking credit for, and utilizing resources for, stopping terrorist threats which might never have been meaningful without FBI involvement. On the other hand, publicity such as this might spread mistrust and paranoia among would-be terrorists, making them afraid to cooperate with others out of fear that they might be FBI undercover FBI agents. 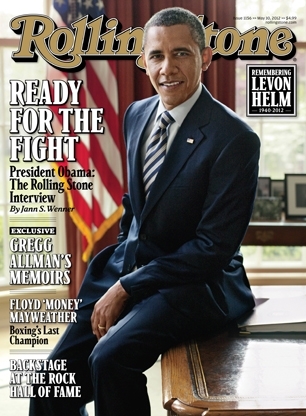 Barack Obama is on the cover of Rolling Stone. The interview started out with Obama making a point which I think many Democrats have missed. Obama has been criticized for trying to attract Republicans when it is obvious that Republican politicians have no intention to compromise. They prefer to block anything proposed by Obama for political gain, regardless of how much harm they do to the country. However, in trying to make his policies attractive to Republicans, it is Republican voters, not politicians, who Obama wants to attract. Many are brainwashed by Fox and the right wing noise machine, but Obama showed in 2008 that he can attract enough former Republican voters to win in states where Democrats had not won recently. Let’s talk about the campaign. Given all we’ve heard about and learned during the GOP primaries, what’s your take on the state of the Republican Party, and what do you think they stand for? First of all, I think it’s important to distinguish between Republican politicians and people around the country who consider themselves Republicans. I don’t think there’s been a huge change in the country. If you talk to a lot of Republicans, they’d like to see us balance the budget, but in a balanced way. A lot of them are concerned about jobs and economic growth and favor market-based solutions, but they don’t think we should be getting rid of every regulation on the books. There are a lot of Republican voters out there who are frustrated with Wall Street and think that they acted irresponsibly and should be held to account, so they don’t want to roll back regulations on Wall Street. But what’s happened, I think, in the Republican caucus in Congress, and what clearly happened with respect to Republican candidates, was a shift to an agenda that is far out of the mainstream – and, in fact, is contrary to a lot of Republican precepts. I said recently that Ronald Reagan couldn’t get through a Republican primary today, and I genuinely think that’s true. You have every candidate onstage during one of the primary debates rejecting a deficit-reduction plan that involved $10 in cuts for every $1 of revenue increases. You have a Republican front-runner who rejects the Dream Act, which would help young people who, through no fault of their own, are undocumented, but who have, for all intents and purposes, been raised as Americans. You’ve got a Republican Congress whose centerpiece, when it comes to economic development, is getting rid of the Environmental Protection Agency. If you want to lower the deficit, reduce government intrusion in individual’s personal lives, have lower taxes on the middle class, and a stronger defense against al Qaeda, all things I would expect Republican voters to support, Obama has been the one to offer more sensible positions on these issues. Given all that, what do you think the general election is going to look like, and what do you think of Mitt Romney? I think the general election will be as sharp a contrast between the two parties as we’ve seen in a generation. You have a Republican Party, and a presumptive Republican nominee, that believes in drastically rolling back environmental regulations, that believes in drastically rolling back collective-bargaining rights, that believes in an approach to deficit reduction in which taxes are cut further for the wealthiest Americans, and spending cuts are entirely borne by things like education or basic research or care for the vulnerable. All this will be presumably written into their platform and reflected in their convention. I don’t think that their nominee is going to be able to suddenly say, “Everything I’ve said for the last six months, I didn’t mean.” I’m assuming that he meant it. When you’re running for president, people are paying attention to what you’re saying. Let me ask you about the War on Drugs. You vowed in 2008, when you were running for election, that you would not “use Justice Department resources to try and circumvent state laws about medical marijuana.” Yet we just ran a story that shows your administration is launching more raids on medical pot than the Bush administration did. What’s up with that? Here’s what’s up: What I specifically said was that we were not going to prioritize prosecutions of persons who are using medical marijuana. I never made a commitment that somehow we were going to give carte blanche to large-scale producers and operators of marijuana – and the reason is, because it’s against federal law. I can’t nullify congressional law. I can’t ask the Justice Department to say, “Ignore completely a federal law that’s on the books.” What I can say is, “Use your prosecutorial discretion and properly prioritize your resources to go after things that are really doing folks damage.” As a consequence, there haven’t been prosecutions of users of marijuana for medical purposes. The only tension that’s come up – and this gets hyped up a lot – is a murky area where you have large-scale, commercial operations that may supply medical marijuana users, but in some cases may also be supplying recreational users. In that situation, we put the Justice Department in a very difficult place if we’re telling them, “This is supposed to be against the law, but we want you to turn the other way.” That’s not something we’re going to do. I do think it’s important and useful to have a broader debate about our drug laws. One of the things we’ve done over the past three years was to make a sensible change when it came to the disparity in sentencing between crack cocaine and powder cocaine. We’ve had a discussion about how to focus on treatment, taking a public-health approach to drugs and lessening the overwhelming emphasis on criminal laws as a tool to deal with this issue. I think that’s an appropriate debate that we should have. Changing the legislation is important, and I do wish Obama would propose some meaningful changes. There is no doubt that the medical marijuana laws are used for people to obtain marijuana for uses beyond medical uses. On the other hand, it is clear that prohibition does not work and there is no point in using government to try to prevent the use of marijuana. I back the position of the California Medical Association in having doubts about the system for medical marijuana but believe the answer is to legalized marijuana and get government out of this issue. Occupy Wall Street seems to have influenced your rhetoric. Has it had a deeper impact on your thinking about America? You know, I think that Occupy Wall Street was just one vivid expression of a broader anxiety that has been around in the United States for at least a decade or more. People have a sense the game is rigged, so just a few people can do well, and everybody else is left to scramble to get by. The free market is the greatest generator of wealth in history. I’m a firm believer in the free market, and the capacity of Americans to start a business, pursue their dreams and strike it rich. But when you look at the history of how we became an economic superpower, that rugged individualism and private-sector dynamism was always coupled with government creating a platform so that everybody could succeed, so that consumers weren’t taken advantage of, so that the byproducts of capitalism, like pollution or worker injuries, were regulated. Creating that social safety net has not made us weaker – it’s made us stronger. It liberated people to say, “I can move to another state, but if I don’t find a job right away, my kids aren’t going to go hungry. I can start a business, but if it doesn’t work out, I’m going to be able to land on my feet.” Making those kinds of commitments to each other – to create safety nets, to invest in infrastructure and schools and basic research – is just like our collective investment in national security or fire departments or police. It has facilitated the kind of risk-taking that has made our economy so dynamic. This is what it means for us to live in a thriving, modern democracy. One of the major arguments we’ll be having in this election season is a contrasting vision that says not just that government is part of the problem, but essentially that government is the entire problem. These guys, they don’t just want to roll back the New Deal – in some cases, they want to go back even further. Do you read Paul Krugman?I read all of the New York Times columnists. Krugman’s obviously one of the smartest economic reporters out there, but I also read some of the conservative columnists, just to get a sense of where those arguments are going. There are a handful of blogs, Andrew Sullivan’s on the Daily Beast being an example, that combine thoughtful analysis with a sampling of lots of essays that are out there. The New Yorker and The Atlantic still do terrific work. Every once in a while, I sneak in a novel or a nonfiction book. There’s far more in the full text of the interview. I fear that Occupy Wall Street has jumped the shark with their talk of a general strike. Actually I thought this a while back, when their focus shifted from legitimate grievances about income redistribution to the top one percent to battles over occupying areas. I also think that “income inequality” is not the right term to use. There always will be, and should be, differences in earning based upon skills and achievement. Many hearing of protests against income inequality misunderstand it to believe the movement, and liberals, oppose such appropriate levels of inequality. It only feeds into the ridiculous view on the right that liberals such as Obama are socialists. Reading the conservative blogs shows the degree of misunderstanding of the issue, with many conservatives finding it to be some sort of contradiction when affluent liberals, and not just the unemployed, show concern over the concentration of wealth by the ultra-wealthy. The real issue is the considerable increase in income concentration in the top 1 percent (and top one tenth of one percent) in recent years, which has been exacerbated by government policy. Inequality may or may not be acceptable depending upon the specifics, but it is this degree of concentration of the wealth of this nation by a tiny plutocracy which is not. Other points which should be stressed are the decrease in upward mobility and the weakening of the middle class. Americans typically have no problem with the wealthy, hoping to have the chance to join them. Stressing income inequality does not appeal to many of them. Stressing the fact that it is now harder for those in the middle class to become wealthy than in the past would be a far more compelling argument. Weakening the middle class means that middle class individuals have a far greater chance of winding up among the poor than the wealthy is an important wake-up call about the direction this country is moving in. Ultimately the weakening of the middle class is even harmful to the top 1 percent–a reason why many wealthy individuals have come out in recent weeks to support Democratic policies. They know that the tiny increases in marginal tax rates being proposed will not harm them, and certainly will not reduce job creation. Gallup found that between 2008 and 2011 less people see America as being divided between haves and have-nots. This includes a drop from 48 percent to 37 percent among independents. Reducing the income gap is not a key priority among independents: “While 72% of Democrats say it is extremely or very important to reduce the income and wealth gap between rich and poor, 43% of independents and 21% of Republicans agree.”Far more independents (82 percent) find policies to expand and grow the economy to be extremely or very important (with another 12 percent finding this somewhat important). It is not that opposing income inequality and supporting economic growth are mutually exclusive. The unprecedented degree of concentration of wealth in a small group (which is the real issue as opposed to simply inequality) is one of the forces which is destabilizing the economy. In stressing income inequality, the Occupy Wall Street movement fails to obtain the support of many independents who would support policies to strengthen the middle class and expand the economy. Republicans have done much better than Democrats at framing their arguments and choosing the right words to maximize their support–regardless of whether conservative frames provide an honest look at the issues. Some on the left have tried to counter with the Occupy Wall Street movement and claims of supporting 99% versus the 1%. The movement has had success in drawing attention to their issues, and changing policy discussion away from what was increasingly a discussion of what spending to cut regardless of the merits. However, I have feared from the start that concentrating on words involving occupation would limit their potential success. Even the liberal Members of Congress originally scheduled to meet with the Occupiers were careful to separate the public face of the protesters and the concerns that spawned them. Stressing how their policies are to protect “99 percent” is definitely preferable to stressing occupation. The movement needs to concentrate on the issues as opposed to the strategy of occupation. I also think that “income inequality” is not the right term to use. There always will be, and should be, differences in earning based upon skills and achievement. Many hearing of protests against income inequality misunderstand it to believe the movement, and liberals, oppose such appropriate levels of inequality. It only feeds into the ridiculous view on the right that liberals such as Obama are socialists. Reading the conservative blogs shows the degree of misunderstanding of the issue, with many conservatives finding it to be some sort of contradiction when affluent liberals, and not just the unemployed, show concern over the concentration of wealth by the ultra-wealthy. It is no surprise that the Tea Party has not only declined in support but has also dragged down the GOP. Polls have also showed declining support for the Occupy Wall Street movement but obviously we cannot have a comparable study of Congressional districts which have elected OWS candidates. I expect OWS to continue to lose support as long as they concentrate on fighting over being able to occupy public property as opposed to concentrating on their original issue of income inequality. If OWS continues on its current road and falls in support, hopefully they will neither drag down the Democratic Party or cause people to forget about the underlying issue–an area of original success.